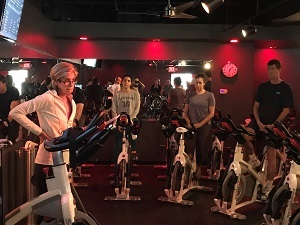 Earlier this month, Nancy and Michael Grogan, along with other cycling enthusiasts, family and friends who believe in the Partnership’s mission, came together for the Second Annual Ride for Recovery, which took place at Cyclebar in Wellesely, Massachusetts. Together, they raised more than $12,000 to help us provide guidance and one-on-one support to parents and families. Nancy and Michael are passionate about helping reduce the shame and stigma associated with the disease of addiction as they have numerous family members and friends who have struggled with substance use disorders. Nancy is active in the Boston area in local Alanon and Naranon groups and she serves as a Parent Coach for the Partnership. We extend a special thank you to Bill Pryor and Alex Klemmer of Cyclebar for donating their studio to host the event and to Chris O., a young man in recovery who shared his personal story to inspire participants as they began their ride. To learn how you can use your passions and interests to raise funds and awareness on behalf of the Partnership, please visit hope.drugfree.org.